One Can Have Her puts you in the gumshoes of an archetypical noir hero (the nervous government agent, the greedy nightclub singer, the arrogant doctor) and pits you against "two or more" others, all competing for the girl, the gold watch and everything else this topsy-turvy world promised you when you first entered it all those years ago. "I'm interested in film noir," says Jonas Ferry, the Swedish creator of One Can Have Her, "and have watched a lot of old classics. There's something about the strict formula of transgression/punishment, the desperation of the characters and the moral ambivalence that makes me watch them." With One Can Have Her, Ferry says he was looking for "a new way of generating story through conflicts." And to do so, he had to reinvent the roleplaying game, introducing an element sorely lacking in spite of over two decades of RPG evolution: real storytelling. For roleplayers interested in something other than Dungeons & Dragons - or Drakar och Demoner, a smilar game played in Sweden, which literally translates to "Dragons and Demons" - there are a host of commercially available alternatives, up to and including White Wolf's World of Darkness games and Steve Jackson's dizzying array of GURPS-based adventures . But as with any commercial industry, only the most commonly acceptable varieties of roleplaying games ever make it to store shelves, and even among those that do, very few become popular, and among those, according to Ferry and others, few provide "the tools needed to roleplay." "The Forge is an online forum for development and discussion of independently published roleplaying games," says Ferry. "They produce a lot of 'story games,' roleplaying games that focus more on producing great stories than pretending to be another person for an evening. "[In most roleplaying games] there's always a lot of rules about car chases and the damage table when you take a fall ... tables for how much damage a weapon does and how much a blanket weighs or things like that. ... But I wasn't interested in that. When I found The Forge, I realized they were doing games that focused on the things I was interested in - like story and character." 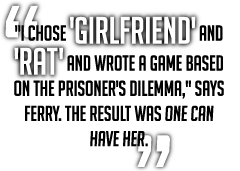 In 2005, Jonas Ferry entered a 24 Hour RPG contest organized by The Forge founder, Ron Edwards. The contest (called "The Ronnies") challenged game designers to create an RPG centered on any two of the words suburb, hatred, girlfriend or rat, in just 24 hours.